Reagan and Gorbachev arrive at Hofdi House, Reykjavik. Ronald Reagan, the unreconstructed Cold Warrior and opponent of détente, succeeded in doing more damage to nuclear orthodoxy than all of his predecessors combined. Another irony was that Reagan’s treasured SDI, the deal-breaker at Hofdi House, became the victim of Reykjavik’s successes. Before Reykjavik, SDI was already politically and financially hamstrung by Democrats on Capitol Hill; even its more prosaic parts were severely challenged on technical grounds. After agreeing in principle to deep cuts in strategic forces and the elimination of intermediate-range capabilities, the rationale for pursuing advanced, space-based defenses was shredded. No formalities were needed for SDI’s demise. Instead, the George H.W. Bush Administration “grounded” strategic defenses, focusing on land- and sea-based interceptors, as it signed on to deep cuts in strategic offensive forces. This crucial pivot is completely missing from Adelman’s account, which now credits Reagan with masterful negotiating skills and with having “surprising depth and dexterity on the crucial issues of his day.” Reagan’s “coherent strategic approach” and his constancy, in Adelman’s retelling, helped end the Cold War by holding fast to SDI and driving hard bargains to demolish excessive nuclear weapon stockpiles. These conclusions are far more charitable than his earlier account, The Great Universal Embrace. Published within two years of the INF Treaty signing, Adelman depicted Reagan as “a man singularly endowed with an ability to hold contradictory views without discomfit.” The discussions at Reykjavik, he wrote, “should never have happened. They showed gross ignorance of essentials of Western security.” Adelman described his associates back then as “an accountability-free administration.” Senior officials played to Reagan’s contrarian views, shying away from trying to force reality checks. Instead they signed up to negotiating postures assuming that they would be rejected out of hand by the Kremlin. In The Great Universal Embrace, as in Strobe Talbott’s accounts, Secretary of State George Shultz and his arms control éminence grise, Paul Nitze, sought leverage to make deals that the President was unwilling to make. Secretary of Defense Caspar Weinberger and his Assistant Secretary, Richard Perle, sought leverage to foreclose deals. “What disturbed me most,” Adelman wrote, “was their reluctance to be frank with the President.” Instead, he and his colleagues crafted “neat” arms control initiatives that had the ring of symmetry and the illusionary promise of deep reductions. Effective public relations were more important than improbable outcomes. In The Great Universal Embrace, Adelman concluded that when Gorbachev called Reagan’s bluff, he succeeded in “taming” Reagan and unwisely “legitimizing” arms control. In Reagan at Reykjavik, he writes that Reagan delegitimized the Soviet Union, facilitating its demise, helping Europe to become united and free, liberating 415 million people from Communism and slashing nuclear stockpiles. These conclusions give one man or the other too much credit. What’s a truer calibration? Reagan’s critics thought his inflammatory remarks about the Soviet Union were unwise and dangerous. Adelman argues, to the contrary, that Reagan deserves credit for systematically delegitimizing the Soviet Union, adding flammable material to decades of Soviet misrule and economic mismanagement. The biggest arsonist, by far, was Gorbachev who, as Adelman writes, “wanted to reform the Soviet Union in the worst way possible. And that’s pretty much how he did it.” Where Adelman goes off the tracks is crediting SDI with “pushing his reforms to the brink of disaster, and over.” This ignores Gorbachev’s change of tactics, as evident in his exchange with Reagan at the INF Treaty signing summit, as well as the domestic U.S. constraints on SDI that became more ironclad after the Treaty was signed. Reagan remains very hard to pin down, and Adelman has every right to change his views about him with the passage of time. This reviewer certainly has. When Reagan became president, I expected bad choices and wasn’t disappointed during his first term. During his second term, I became an admirer of his unflinching commitment to reduce nuclear weapons. Reagan built up in order to build down. We were all familiar with going uphill; going downhill was a completely unique and unexpected experience. For this, we have Reagan as much as Gorbachev to thank. Republicans have drifted away from Reagan’s legacy in this regard. They now insist on keeping excess Minuteman silos ready for reloads. Adelman can therefore be forgiven for not helping readers to figure out Reagan. We can only marvel in these pages how he and Gorbachev bandied about proposals to eliminate nuclear weapons while their military aides carrying the “footballs” with nuclear access codes stood staring blankly past each other in the hallway of Hofdi House. If deals had somehow been struck in Reykjavik, Adelman believes that would have unraveled. Skeptics would have pounced on details and imprecision. I agree with him. Both Presidents were way ahead of their governments and the rest of us. Their reach exceeded their grasp, but they changed the paradigm of strategic arms control to strategic arms reductions as they slashed force structure and rungs on the escalation ladder. 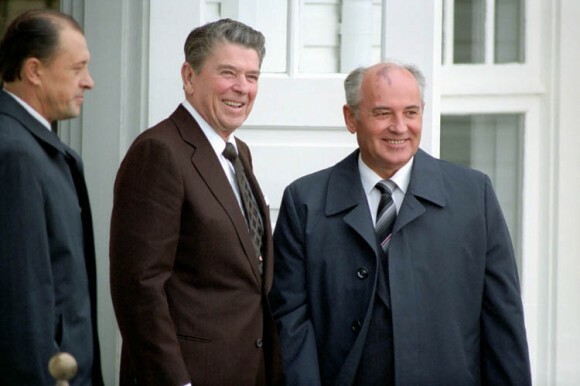 Reagan and Gorbachev reached for the stars. One came crashing down along with the Union of Soviet Socialist Republics, which was not amenable to his radical reforms. The other now resides in the firmament of America’s most successful presidents. Go figure. NUCLEAR WEAPONS INVESTMENTS SLIDE 40 PCT. The Dutch investments in the nuclear industry have fallen with about 40 percent this year. Banks, pensions and insurers invested 1.4 billion dollar less in the production of nuclear weapons. This is evident from the annual examination of the investments in producers of nuclear weapons done by worldwide peace organization PAX. Last year the thirteen Dutch financial institutions accounted for nearly 3.5 billion dollars of the investments. With each of America’s nuclear submarines costing close to $2 billion to build and another $50 million annually to operate, a diesel-electric hybrid submarine could come in at a much lower cost without sacrificing much in the way of capabilities or armament. The U.S Navy is seeking to diversify its fuel sources, and while nuclear submarines may have a potential service life of 33 years or more each, the future of underwater warfare may have just taken a silent and deadly twist. –Credit is due to the “Fierce Homeland Security” website for informing me of the PDF format article below. In 2009, President Obama spotlighted nuclear terrorism as one of the top threats to international security, launching an international effort to identify, secure, and dispose of global stocks of weapons-usable nuclear materials—namely highly enriched uranium and weapons-grade plutonium. Since that time, three nuclear security summits have been held, along with scores of studies and workshops (official and unofficial), drawing sustained high-level attention to the threat posed by these materials. However, little attention has been given to incidences where sensitive nuclear materials actually went missing. This volume seeks to correct this deficiency, examining incidences of material unaccounted for (MUF) arising from the U.S. and South African nuclear weapons programs, plutonium gone missing from Japanese and British civilian production facilities, and a theft of highly enriched uranium from a U.S. military contractor in the 1960s that was used to help fuel Israel’s nuclear weapons program. This volume also questions the likelihood that the International Atomic Energy Agency would be able to detect diversions of fissile materials, whether large or small, and the likelihood that a state could or would do anything about the diversion if it was detected. What emerges from this book is an assessment of how likely we are to be able to account for past MUF quantities or to be able to prevent future ones. Top officials at the Lockheed Martin Corporation in 2009 sought to extend their lucrative contract work managing Sandia National Laboratories for the Energy Department, and expected that their political connections would help them gain an inside track for a noncompetitive contract renewal. This is, after all, how Washington usually functions. But the Energy Department’s top auditor has asserted in a riveting new report that the firm, and top officials that helped it operate the Sandia nuclear weapons labs in Albuquerque, appear to have violated federal laws when they used some of their contract funds to pay for lobbying and other forms of pressure on DOE to obtain the contract renewal. The firm argued during the department’s review of its actions that spending federal funds to obtain more federal funds was “allowable” and only was meant to help the department’s leaders make an informed decision, according to the Nov. 12 report by DOE Inspector General Gregory H. Friedman. But Friedman called that decision “highly problematic.” He said it was not only a violation of government-wide contracting regulations, but also “impermissible” under the precise wording of Sandia’s longstanding, multi-billion dollar contract with DOE. The funds will pay for two machines, one for civilian research at the Oak Ridge National Laboratory in Tennessee and one for nuclear weapons simulation at the Lawrence Livermore National Laboratory in California. They’ll each clock in with a peak performance surpassing 100 petaflops — that’s a quadrillion calculations per second as measured in the Top500 list that ranks the world’s fastest machines. Trying to do that with modern laptops would take something like 3 million of them, Nvidia estimates.